A double-double from Chrisalyn Johnson and a big blocking effort helped the UAA volleyball team survive a 30-kill night by a Barton College player Friday night at the Alaska Airlines Center. Johnson's 15 kills and 15 digs and the team's 14 blocks were enough to subdue the Bulldogs, an NCAA Tournament team last season. Kaytlin Elkins pounded 30 kills and accounted for half of Barton's 144 attacks, but she also made 14 hitting errors. Johnson, a senior outside hitter from Anchorage, tallied the 26th double double of her career to help the Seawolves improve to 2-0. 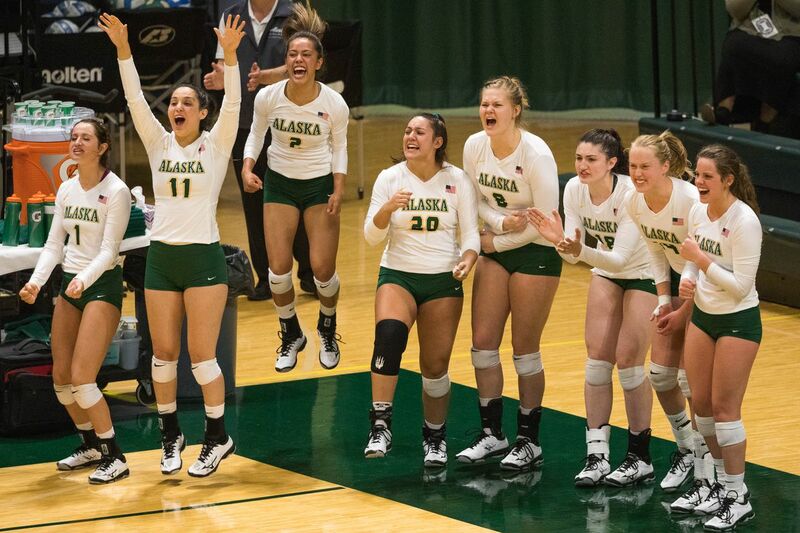 UAA is back in action Saturday when the five-team UAA Invitational wraps up with four matches. "That was a scrappy win," UAA coach Chris Green said in a release from the school. "We didn't play as well, especially defensively, as we would've liked, but our block was huge and that was a big factor." Green said the team knew they needed to slow down Elkins, a 5-foot-8 sophomore outside hitter, "so we knew where we had to block and we did a good job for the most part." "We had a good matchup in the fourth game with Eve against (Elkins), and that forced her to make a couple errors and we got a couple blocks on her," he said. Johnson was one of three Seawolves to deliver double-digit digs. Anjoilyn Vreeland had a team-high 19 and Taylor Noga added 12, but UAA's 61 digs were eclipsed by Barton's 65. Riley Bane led the Bulldogs with 24. The Seawolves outhit the Bulldogs .217 to .097 — Noga and Eve Stephens each had nine kills — and outblocked them 14-5. Stephens was in on seven blocks, and Vera Pluharova contributed two solo blocks. It was the second straight win in as many matches for UAA, which opened Thursday with a three-set win over Western New Mexico University. It was the second straight loss to Barton, which dropped a four-set decision to Western New Mexico earlier Friday. Michigan Tech won twice on Friday, outlasting UAF in five sets and beating Western New Mexico in four. South High alum Tatum Upchurch led the Nanooks with 13 kills and 14 digs in the loss to Tech.